Professional horse trainers have years of experience and many have attended workshops and training themselves. If you are a new horse owner and don’t have ready access to a trainer, however, you need to learn some basics. Ideally, you can observe an experienced horse person handle a horse, and have a safe and sane horse to work with. Safety is paramount; if you are ever afraid, wait for experienced help. Understanding your horse’s instinctive behavior, physical limitations and abilities is essential to proper handling and training. Horses are prey animals, meaning they are hard-wired to sense and flee from predators. Many horse people call this behavior “fight or flight” -- your horse instinctively will flee from anything that startles him unless he has protection from a herd. Keep your demeanor around your horse quiet and calm; he will soon understand that if you’re not worried, he doesn’t need to worry either. Protecting yourself is paramount when training horses. This starts with appropriate clothing. Always wear closed-toe boots with a hard toe when you’re around your horse. The first time your horse steps on you -- and he will at least once -- you’ll understand why and be grateful for that protection. A helmet also is necessary, even if you’re not riding. Horses with little or no training are concerned about themselves -- not you. Your horse can do something innocent, like lift his hind leg to shoo away a pesky fly and accidentally hit you in the head. Wear leather gloves to protect your hands from rope burns if he pulls while being led. Your horse can’t see directly in front or behind him -- this is nature’s way of allowing him to see predators approaching from either side -- so stand to the side, next to his shoulder. Keep a hand on him as you move around him so he always knows where you are. Your horse’s entire training depends on him responding appropriately to pressure. When he feels pressure from a lead rope, moving forward releases the pressure. When he is tied and tries to move backward, he learns that by taking a step forward and standing still, he no longer feels pressure. Start with putting on his halter. 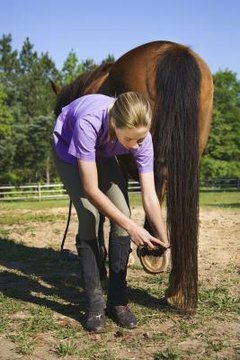 Leave it on for several minutes or even hours, as long as he is quiet and in a safe place like a stall -- don’t turn him out where it can get hung up on tree branches or fence posts. Take the halter on and off several times until it becomes routine. Once he accepts the halter, attach a lead rope long enough to wrap around his hindquarters. Exert just enough pressure on the end attached to the halter, and the other end in your hand, so he takes a step forward. As soon as he takes a step, release the pressure. Your horse soon will learn to start moving from his hind end when he feels pressure from the lead rope attached to the halter. When your horse is comfortable leading, begin tying. Be sure to tie him on a ring or post higher than his withers to minimize injury. Tying a piece of rubber like a tire tube to the ring, and then tying the lead rope to that, allows your horse some give when he pulls while still securing him. It also can minimize injury to his neck if he really pulls. Practice tying for longer periods each day but always quit when your horse is still -- not when he is pacing or moving. Your horse needs to accept humans handling him for both training and routine vet care. Brush him each day, talking quietly. Teach him to pick up his feet so you can clean them with a hoof pick. Stand at his shoulder, facing the rear of your horse. Reach down and touch his leg above the hoof. He may react by picking it up; if he does, hold it for a minute, then set it down gently before he tries to yank it away. Ask again, holding it longer each time. If he balks, squeeze the inside of his leg until he responds to the pressure. Repeat on his other front foot, and then the hind feet. He will soon pick up his feet immediately when you bend over and ask by touching his lower leg.